GEDDIE, JOHN, Presbyterian clergyman and missionary; b. 10 April 1815 in Banffshire, Scotland, only son of John Geddie and Mary Menzies; d. 14 Dec. 1872 at Geelong, Australia. John Geddie’s family immigrated in 1817 to Pictou, Nova Scotia, then the centre of the timber trade in the province. There they joined the Secession Church under Dr Thomas McCulloch*. John was educated at the Pictou grammar school and Pictou Academy. During his formative years the young man worked with his father as a clockmaker, but spent many hours reading books sent by the London Missionary Society. When he was 19 he made a public profession of religion and enrolled in theology courses under Dr McCulloch. Geddie was licensed to preach by the presbytery of Pictou on 2 May 1837. 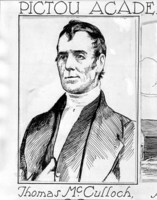 After working in various congregations he was called to Cavendish and New London, Prince Edward Island, on 13 March 1838 and was ordained there. 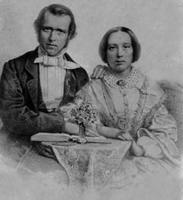 On 21 Sept. 1839 at Antigonish, N.S., he married Charlotte Lenora Harrington MacDonald, who was to bear him eight children. The young minister longed to undertake missionary work although, at that time, no branch of any Presbyterian church in the British colonies was actively involved in missions. Geddie organized a missionary society in his own church and persuaded other congregations to do the same. He also wrote letters to the local Island papers and to the Presbyterian Banner, and brought his suggestions for missionary work before the presbytery of P.E.I. and the synod of Nova Scotia. Finally a board of foreign missions was appointed with the Reverend James Waddell as recording secretary and John Geddie as corresponding secretary. At a synod meeting in July 1845 the board reported that $1,000 had been collected; the synod, by a vote of 13 to 12, decided that the board should select a field “and negotiate with candidates for occupying that field as soon as possible.” The New Hebrides was chosen and John Geddie, who had volunteered, was selected as the potential missionary. Geddie spent the next year preparing himself for the new life. At the offices of the Eastern Chronicle in Pictou, he learned to operate a printing press, which he would take with him; he studied the rudiments of house building and shipbuilding; he learned to identify and treat tropical diseases. Shortly after their designation service at Pictou on 3 Nov. 1846, Geddie, his wife, and their two small children sailed from Halifax. They spent eight months in Samoa learning the language, then settled in July 1848 at Aneiteum, the most southerly of the New Hebrides. There they encountered tropical storms, strange new diseases, and suspicious natives, described as heathen cannibals. By the end of the second year Geddie reported that ten people were attending his services, but signs of success began to increase rapidly thereafter. Geddie organized a school which the natives began to attend, and he printed school books in their language on his press. His wife, a doctor’s daughter, dispensed medicines and attempted to discourage the natives from following some of their old customs. To prevent the habit of strangling widows, she took the women into her home. In 1857 the Geddies were joined by the Reverend George N. Gordon* and his wife, who were killed by natives in 1861. In 1863 a mission vessel, Dayspring, was sent from Pictou to assist in the work. The money to build her had been raised mainly from Sunday school collections and mite boxes, one of which was in practically every Presbyterian home in the area. Aboard Dayspring were more missionaries including the Reverend James Douglas Gordon, to carry on the work of his slain brother, the Reverend Donald Morrison and his wife, and the Reverend William McCulloch, son of Thomas McCulloch. After 15 years at their post Geddie and his wife returned to Nova Scotia on furlough. While in Canada Geddie received a dd from Queen’s University at Kingston, but he spent most of his time in Nova Scotia visiting churches and recounting the dramatic tale of the mission. He also worked at revising his translation of the Book of Psalms into Aneiteumese. The Geddies were back in Aneiteum on 5 Sept. 1866, but the missionary’s health was deteriorating. He spent the remaining years of his life in the New Hebrides and in Australia mainly working on his translations of various books of the Bible into Aneiteumese. He finished a translation of the New Testament, and at the time of his death was working on the Old Testament. John Geddie’s death was widely reported in the Nova Scotia press where his work had been greatly admired. As a memorial a fund of $6,000 to assist the widows and orphans of missionaries was announced by the Home and Foreign Record of the Presbyterian Church of the Lower Provinces in May 1873. Maritime Conference Archives of the United Church of Canada, Pine Hill Divinity Hall (Halifax, N.S. ), Dr John Geddie scrapbook, letters of the Reverend John Geddie, 14 Jan. 1845–May 1870, extracts from his journal; Presbyterian Church of Nova-Scotia (Secession), Minutes of the proceedings of the synod, 3 July 1817–15 July 1842; Presbyterian Church of Nova Scotia, Minutes of the proceedings in the synod, 4 July 1843–4 Oct. 1860; Presbyterian Church of the Lower Provinces of British North America, Minutes of the synod, 4 Oct. 1860–1875. Acadian Recorder (Halifax), 12 March 1873. Christian Instructor, and Missionary Register, of the Presbyterian Church of Nova Scotia (Halifax, then Pictou, N.S. ), I (1856)–V (1860). Eastern Chronicle (Pictou, N.S. ), 1843–65. Home and Foreign Record of the Presbyterian Church of the Lower Provinces of British North America (Halifax), I (1861)–XV (1875). Missionary Register of the Presbyterian Church of Nova-Scotia (Pictou, N.S. ), I (1850)–7 (1856). J. W. Falconer, John Geddie, hero of the New Hebrides (Toronto, ). J. P. MacPhie, Pictonians at home and abroad (Boston, Mass., 1914). George Patterson, Missionary life among the cannibals: being the life of the Rev. John Geddie, D.D., first missionary to the New Hebrides; with a history of the Nova Scotia Presbyterian mission on that group (Toronto, 1882). Phyllis R. Blakeley and Diane M. Barker, “GEDDIE, JOHN (1815-72),” in Dictionary of Canadian Biography, vol. 10, University of Toronto/Université Laval, 2003–, accessed April 21, 2019, http://www.biographi.ca/en/bio/geddie_john_1815_72_10E.html.